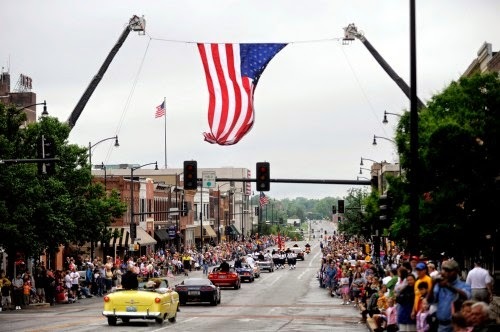 In Columbia, MO the parade went off without a hitch. The Golden Eagles parachuted right onto their marks amongst the various downtown buildings at the start of the parade and of course they nailed their landing. It is a fitting time for all of us to pause and remember those servicemen who died while serving their country. And in fact, it is an appropriate time to honor all veterans for their service. I have always enjoyed working with the Veterans Administration (VA). My hospice is an active participant in We Honor Veterans. And I have always found the quality of care delivered locally to be superb, and I think the VA leaders that I have personally known are dedicated to their jobs and superb leaders, so I have found recent news reports of access problems quite disappointing. But this Memorial Day, I want to bring to your attention a less publicized access issue that impacts veterans: access to hospice. Current statute does not require the VA to cover hospice care for veterans who had not enrolled in the VA system in the past for prior care, or do not fit the family income and asset brackets identified by the VA. The current VA hospice directives are subjective to each individual VA facility and interpreted differently by different caseworkers. Congressman Chris Collins R-NY wants to make sure that no veteran is denied access to hospice. Working with concerned veteran advocates, Collins drafted the Care for our Heroes Act to make all veterans eligible for VA hospice care. This is a bill that should pass. Paul, I am surprised to hear this as in my local VA work, we consider hospice an entitlement for all veterans and have worked hard to expedite enrollment for veterans not previously established with the VA so that can use their benefits. We have also worked on building our HVPs. ANother thought I have had is that I have observed that there are many VA providers that do not have the professional credentials related to community prescribing controlled substances to be readily able to attend in hospice care in the home. I think sometimes this makes situations arise where vets have to meet new providers at the end of life rather than have continuity. I am going to have to read more about the bill though -- thanks for calling it to my attention! Suzanne G.